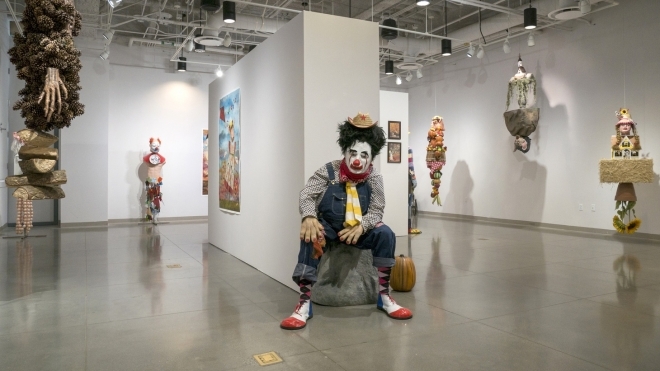 “Send in the clowns… Don’t bother, they’re here.” Nodding to Sondheim, clowns abound in Marnie Weber’s art, most recently in her exhibition as artist-in-residence at Pasadena City College. Clowns are mostly appealing and Weber uses that appeal in complex, absurd and emotionally-involving sculpture and painted collages. At the Boone Gallery, you are greeted by a mannequin of Weary Willie, the popular bearded clown character created by Emmett Kelly in the 1930s that reflected the hopelessness and heroic humor of that era. “Pack up your troubles in an old kit-bag and smile, smile smile.” He stands frowning and forlorn in his patched clothes. In the gallery corner, a bunch of clown heads are mounded into a wheel barrow. For another sculpture, Weber attached a grinning clown’s head atop an armless beefcake torso with a skirt of broken colored glass. On his chest hangs an old china plate painted with the demonic face of a clown and a worried young girl. Clowns are funny, scary, disturbed and disturbing. All are characters in this strange narrative that also involves witches, spells and creatures from the forests and plains. Weber’s imaginary world extends to her superb collages, birch trees with staring girl faces, animals with human heads and humans with animalistic parts. To make them, she cuts around the outlines of photographs her own masks and figures, then arranges the pieces on her hand- painted backgrounds. The effect is as eerie as its subject matter. Each is special and brings into the present the meaning of early 20th century Surrealism. Educated as an artist, Weber initially found her calling by playing bass in a garage rock band The Party Boys. After years of recording and touring in the 1980s, she returned to making art but integrated it with her own performances with her band. Costumes and props were always essential to her work and eventually became the focus of the art itself. The residency at PCC was organized by Mahara Sinclaire and there is a poetic brochure essay by Andrew Beraradini. In the show Twisted Refrain, Weber looks back at an earlier verse and finds ways to rephrase it for new meaning. It is a small show but leaves us hungry for more. The show is on view through April 12.